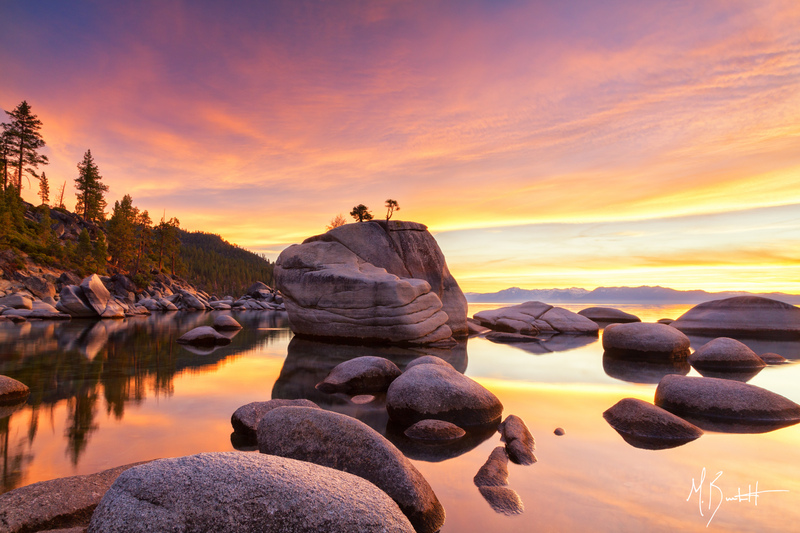 This is the first in a series of posts I’ll be writing over the course of 2016 focused on celebrating the 100 year anniversary of the National Park Service. My passion for photography began with my first visits to a series of the parks and it’s been a love affair ever since. I hope you enjoy the ride this year and are inspired to visit, support, and/or educate others on the importance of why these special places exist. When old man winter comes calling many put their boots and trekking poles away in the closet until spring time returns. Opting to save vacation and time spent with nature during the warm, lengthy summer days. While I love perfect summer days spent in one of my favorite parks, winter can be an adventure of its own. 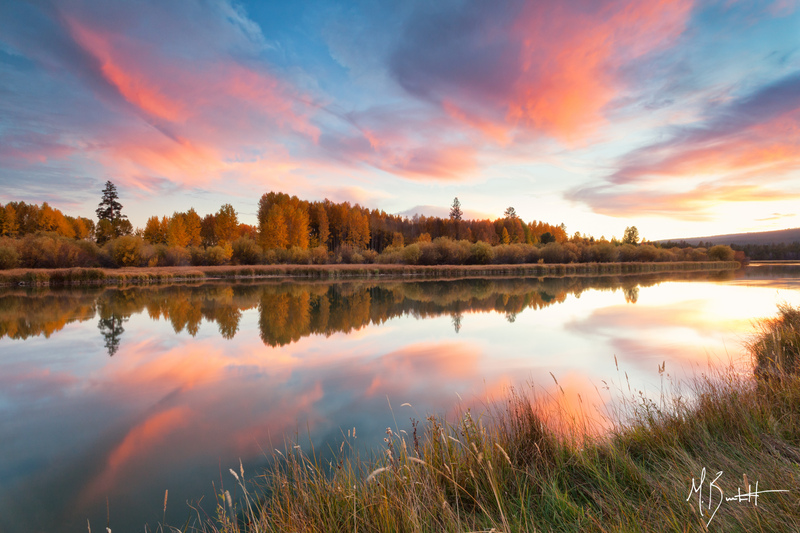 Here’s a few reasons to get out and see your parks once winter season settles in. 1. You’re able to see a park in unique conditions. Winter brings beautiful conditions to many of the northern and higher elevation parks. Winter storms can drop feet of snow during the winter month giving a park a unique look from your typical summer greens and fall yellows. Parks like Crater Lake, Grand Teton, and Mount Rainier wear their winter coats very well and create beautiful conditions for exploration and photography. Winter tends to keep the crowds away from many of the National Parks. In most parks visiting will be much quieter during the colder winter months. It’s likely some trails and vistas will be near empty, even deserted leaving it for you and you alone to enjoy. 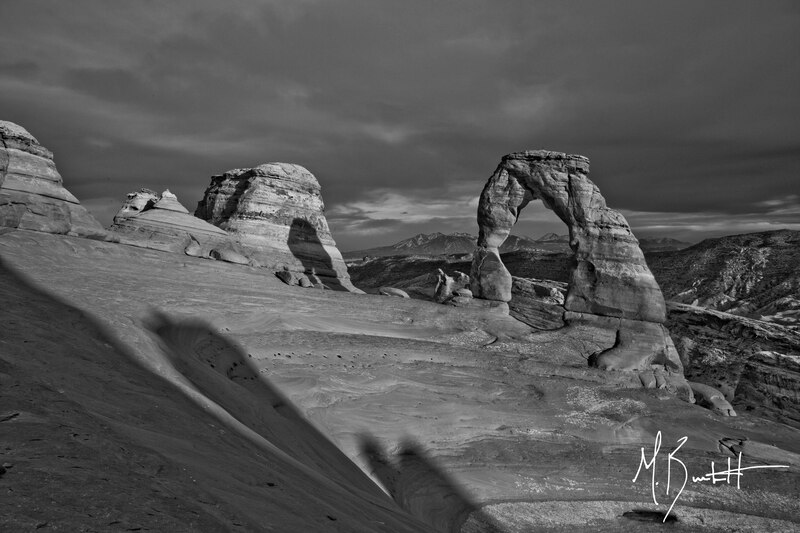 Two years ago I spent several blustery winter days in Arches National Park, deciding one stormy late afternoon to catch sunset at Delicate Arch – I had it all to myself, not another soul around. Not often you can say that about such an iconic location like Delicate Arch! When snow covers the trails and hill sides of our parks it takes work to see views normally driven to. Many viewpoints require a trek via snowshoe or cross-county ski. Anyone who’s done either of those knows it’s quite the workout. Crater Lake is one of my personal favorites – winter brings minimal access points in the park, requiring work for the best views. So once winter hits, grab your gear and get out there to burn off some of those extra holiday calories! I’ve talked a lot about stormy and snowy weather conditions, but what if your just not into that? Head south. 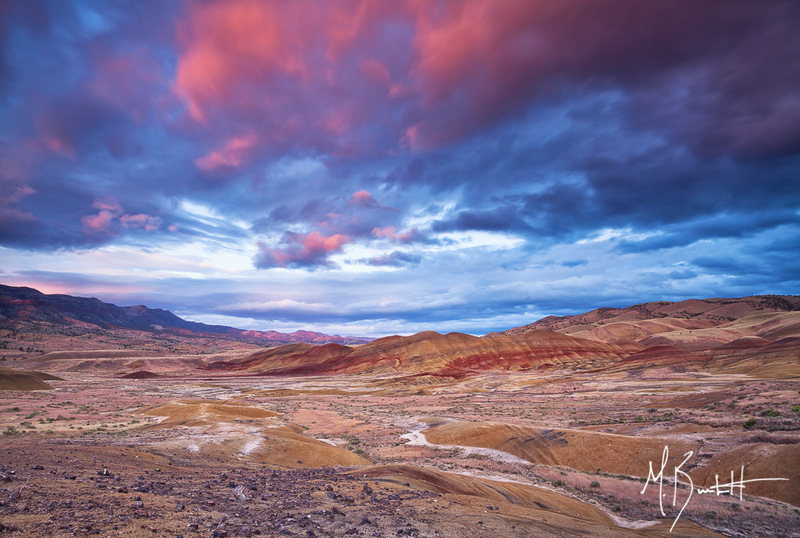 Many of the far southern parks, such as Death Valley, Joshua Tree, Saguaro, and Big Bend National Parks provide some of their best weather during the winter months. Warm days and cool nights make for a perfect escape if snow isn’t your thing. I recently spent several days in December camping, hiking, and photographing Death Valley and Joshua Tree – a perfect escape for anyone needing a break from the winter blues. As another year comes to a close I’ll again be spending time toady to look back on my photographic journey from 2015. This year was a much different one than years past for me. The Northwest’s drought and unusually dry summer put me into a ‘photographic funk’. The mountain wildflowers were early and short lived, lakes were low, and time was spent either under intense storms in the mountain ranges or under bluebird skies. With that said I was forced to challenge myself as well as take a photographic break for a period of time (more on that in a different post). I continued to push myself to learn more, step out of my comfort zone, and look at different perspectives. Below I’m sharing my favorite 10 photos from 2015. Some are my favorites because of striking beauty, some have a personal story to tell, and some pushed me out of my comfort zone. I happy to once again share my top images in Jim Goldstein’s annual blog project. It’s an incredible gathering of photographers from around the world that Jim puts hard work into each January to showcase their best works from the past year. Please be sure to check out the other great posts once it’s completed in early 2015. It’s become a yearly tradition for me to spend at least a few days in Grand Teton National Park. In February I decided to head to the park to see if I could find some mountain snow to explore (snow was a bit on the light side of things in the Pacific NW last winter). Having a fairly mild winter in the Tetons lent for an unusual spot of winter open water at Oxbow Bend. Filtered light throughout the early morning created unique shooting conditions mush later in the day than normal. One of my personal goals in 2015 was to spend more time photographing the Oregon Coast. My interests tend to be more oriented towards the mountains and lush green rivers and falls. I spent a chilly February day at Cape Kiwanda, experimenting with long exposures and waves. I enjoyed the warm pink glow at days end with an ethereal feel in the movement of the waves. While not a unique find due to it’s easily accessed location, the Oneonta Gorge and falls has been on my list to visit and photograph for sometime. Many times over the past several years I’ve planned to hike into this beauty, but it never quite panned out. I’ll leave it at this: it’s a one of a kind place that is very much worth the cold and wet conditions to photograph. One of my hands down favorite waterfalls that I’ve ever spent time at is Abiqua Falls. As the thundering creek pours into the basalt amphitheater you can’t help but be in awe of the raw power of nature. I’ve photographed the fall in color many times, so I decide on this trip with my friend Steve Cole to try a slightly different treatment. I spent time focusing on the column of water and the textures of the basalt that surrounds it. Earlier this year I stumbled upon some information that a series of gorgeous waterfalls lay tucked away in the middle of the Willamette National Forest. With a bit of luck, very hard work, and good company from fellow photographer Jeffrey Green we found what might be one of the truest definitions of a hidden gem I’ve ever laid my eyes on. Summer in the Pacific NW was certainly off from the norm this year. What in normal year occurs in a several week period in multiple locations for wildflower blooms seemed to appear everywhere throughout the Cascades in a period of about 2 weeks. I was lucky enough to time my visit to Canyon Creek right a peak bloom. If you time it just right it’s one of the best displays in Oregon. Best friends sharing a perfect alpine morning in the wilderness. Ellie the adventure dog is my faithful backcountry partner on most of my adventures. There’s not a single time when I grab my camera bag or backpack that she isn’t running towards the door – ready to get outside! I headed out to Smith Rock on a humid, hot summer day hoping for a perfect thunderstorm sunset. However, not a bit of sunset color appeared on this evening. The clouds and ominous approach of thunderstorms to the west made just the right conditions for this image in black and white. Walking through Crested Butte this past fall, I stumbled across a wood walkway with every color imaginable of aspen tree all around. Of course I grabbed my camera gear and began to explore the intimate scenes of fallen leaves that were unfolding all around. This first time I reviewed this image on my camera I knew it was going to be one of my favorites for the year. September and October brought fall color exploration in Colorado. With plans to visit several areas, only one had an ‘absolutely must see’ tag attached to it: Capitol Peak. I had wanted to visit this area for some time and had hoped for clouds, colors, and a sunset to conspire while I was here. Needless to say it was an incredible evening and light display. Thanks to everyone who showed their support this year, to new social media followers, more new friends made on the trail, and especially my wife, Kiersten, who continues to support my passion as a photographer. I’m excited to see what 2016 has in store and I’m ready for some new adventures, new images, and new friends. Happy New Year! 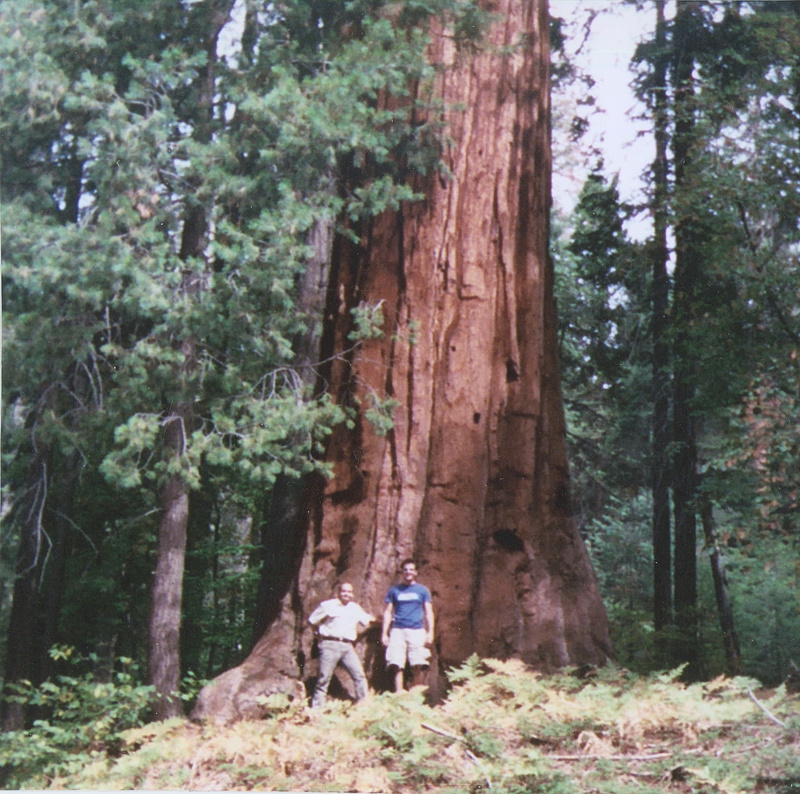 My dad and I standing in front of a massive sequoia tree on our 2002 road trip out west. One of my favorite moments from our first adventure. Some might ask: Why is a photographer writing about Father’s Day on a photography blog? That’s a great question that has a fairly simple answer: I wouldn’t be the photographer I am today if it wasn’t for my father. Let’s take a step back in time to the fall of 2002. From summer until early fall, I spent time piecemealing odd jobs together after my college graduation. All that hard work and all I had to show for it…a $16,000 piece of paper and a slew of new ‘knowledge’, but no real passion or career to speak of. But one of the better questions is, did I know what I wanted to do with my life? Honestly, not yet. Late September rolled around and my father asked me if I was interested in going on a road trip out west. My first and only response was “of course!” Not only was I up for a road trip but what else was I busy doing?…. so together we plotted a course. “Go West young man” my dad would always joke when I was younger – and west we went. Setting sights on our road atlas, we plotted a course along the interstates and back highways that would lead us to some of the most beautiful scenery and locations in the country. Those roads took us through some of the most majestic National Parks that exist. We were in awe. As a photographer, I believe that photos relay an incredible amount of information to the viewer. Light, texture, atmosphere, color, a sense of wilderness, beauty, ruggedness, but nothing prepares you for the real thing. Really.. nothing. Arriving at our first destination, Grand Canyon National Park, I stood in awe at the edge of the deep red rock canyon awe-struck. I truly can’t put into words the beauty that spread out in front of my eyes. All I could think about was how much I wanted be in that moment forever. I wanted to share the lines, textures, light, beauty, and more with others. From my camelbak I pulled out a very simple point-n-shoot camera and started clicking away at the shutter. I couldn’t help but want to keep walking around each and every corner to see what viewpoint or unique angle would open itself up to me. So that’s what we did. For 7 days we drove, hiked, explored, AND photographed the Grand Canyon, Joshua Tree, Sequoia, and Yosemite National Parks. Never before had I used so much film and spent so much time behind a lens, but I was hooked. Would I have become a photographer if my father and I hadn’t taken this road trip? I don’t know, maybe. However, because of the joy of spending a week getting to know my father better than ever before (after a really tough 2001) as well as seeing his enthusiasm for the beauty of the natural world something changed. I had found my place; a passion I truly enjoyed. My hunger for exploration had begun and the fire for photography had been stoked. His encouraging words and support for pursuing my photography have meant the world to me – not to mention having him along for many of those adventures. That trip in 2002 was the first in a long line of road trips across the country spent with my dad. And while we’re separated by half a country now, we’ve made time to keep the tradition alive – last year going to Zion and Death Valley. I want to thank all the Dads out there for all they do for their sons and daughters, especially my Dad. Thanks for getting me started on this crazy adventure of life. Thanks for being my ‘partner in adventure’ for all those years – and I’m excited your still going strong even now! Thanks for being just as excited to see this beautiful country of ours as I am. Thanks for supporting me when life was a struggle. Thanks for sacrificing and working your tail off to give our family a good life. Thanks for creating memories I will never forget. Thanks for setting an example of what hard work looks like and that easy roads get you nowhere. Thanks for being one of the strongest men I know. And lastly thanks for being not only my dad, but my friend. I was inspired to write this post based on a Facebook photography group posting that stirred up a lot of vitriol in the comments section yesterday evening. The group, a typical bunch of happy-go-lucky photographer’s posting their latest images, had a large majority of responders none too fond of one of the images that was posted. I’m not going to list the group, commenters, or the poster of the image, because the specifics aren’t the point. The action being displayed in the image is. The behavior in the photo seems to occur all to frequently in many of the social media platforms, groups, etc. The image in question was one of a young man jumping on top of a sensitive rock formation on the Oregon Coast. While I’m sure the young man’s intentions were not malicious, the resulting photo and posting for hundreds, if not thousands of viewers, lends it self to copy cats. One after another, after another trying to recreate their own insta-twitter-book moment. Ok, then what’s really the problem? We all love social media right? We all want likes and thumbs ups, right? It’s just a photograph, right? The issue many had, as well as my perspective, is that this behavior puts an undue burden on the features, formations, and landscape. Let’s say you live close to a State or National Park with a famous view, rock formation, historic structure, etc. Would you crawl on it? Jump on it? Trample it? Just to get a photo or fun shot for Instagram? Twitter? Facebook? I understand taking photos with individuals enjoying moments in awe inspiring locals. I try to put myself or friends into my photography to give scale and perspective. But we, especially as photographers, have to use good judgement. Just less than 2 years ago Glenn Taylor and David Hall toppled a delicate rock formation over in Goblin Valley State Park (Utah), all the while capturing it on video. This past year Casey Nocket willfully vandalized 8 National Parks for the sake of ‘being creative’, some say fueled by her ability to show it off to others via social media. Trevor Lee recently was fined by the National Park Service, both monetarily and with community service for creating a stream of unique, but illegal photos in Yosemite National Park on his Instagram feed. Mr. Taylor & Mr Hall, Ms. Nocket, and Mr. Lee posted to social media sites touting their ‘accomplishments’ and by no means am I accusing the young man mentioned above of intentionally destroying anything, but the ‘what’s it going to hurt’ mentality for social media posting ties all of the above far too closely together. What this boils down to is as a photographer I’ve come to grow an immense respect for the natural beauty around us and the reality that it is delicate, very delicate at times. Am I perfect? No. I’ve jumped a few barriers & ignored a few signs in my younger days. Do I now try extremely hard to pay utmost attention to being respectful when I’m in a delicate environment? Absolutely, yes. Hindsight puts me in a position where I wish I had the perspective I now have back then. It’s growth and heightened awareness that’s changed me. More time spent in these beautiful and wild places has shaped my perception. As well as simply growing up and being more mature. If we all decide to jump up and down on Balanced Rock, trample the meadows of Paradise at Mount Rainier, or climb all over Delicate Arch – eventually we won’t have Delicate Arch. We won’t have a meadow full of wildflowers. We won’t have Balanced Rock. And Then what? It will be too late to fix. I want to encourage anyone who enjoys the outdoors, wilderness, parks, and trails to set an example. I encourage others to share this and my hope is that others will learn faster and at a younger age, to teach and encourage others to be respectful of those places we all enjoy. Because we ALL want to enjoy them. (I encourage good conversation and open dialogue on this topic and want to hear your thoughts, but anything that turns into poor behavior/mud slinging/name calling/etc won’t be tolerated – those comments will be deleted). As another year comes to a close I’ll be spending a little time toady to look back on my photographic journey from 2014. I spent more days behind the camera, more nights camping in the backcountry, and more miles under my feet exploring this year than ever before. I strived to continue to learn more, step out of my comfort zone, and make new friendships. Below I’m sharing my favorite 10 photos from 2014. Some are my favorites because of striking beauty, some have a personal story to tell, and some pushed me out of my comfort zone. 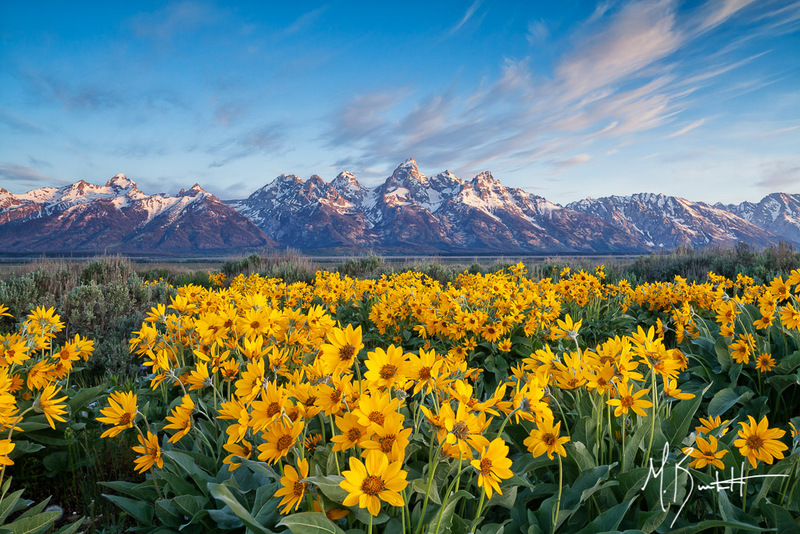 I timed my annual trip to Grand Teton National Park to coincide with the wildflower blooms in the meadows near Antelope Flats. I was amazed by the depth and fullness of this year’s bloom. Spending two of my mornings photographing the area, the second provided perfect soft morning light and light cloud cover over the Tetons. 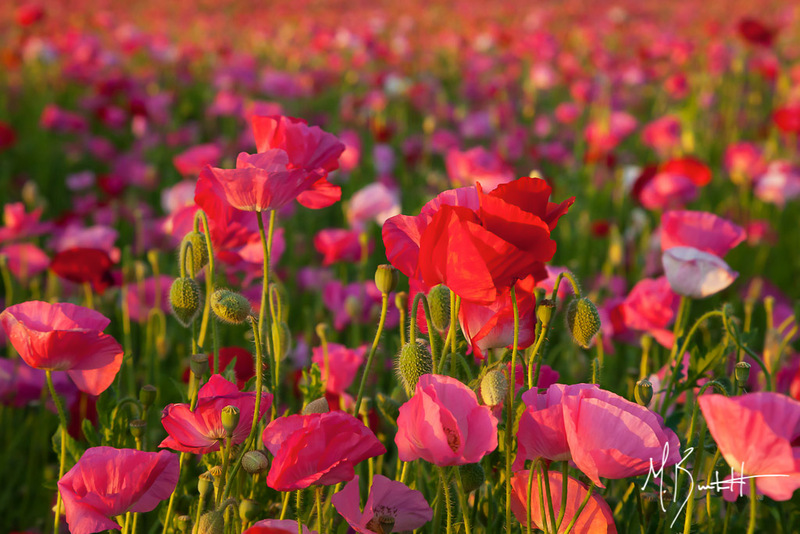 I discovered this field of poppies while driving from the coast range back to Salem in early summer. I new I had to return and spend time studying and photographing them. Surprisingly difficult to photograph, I found this particular composition fitting to frame the flowers. 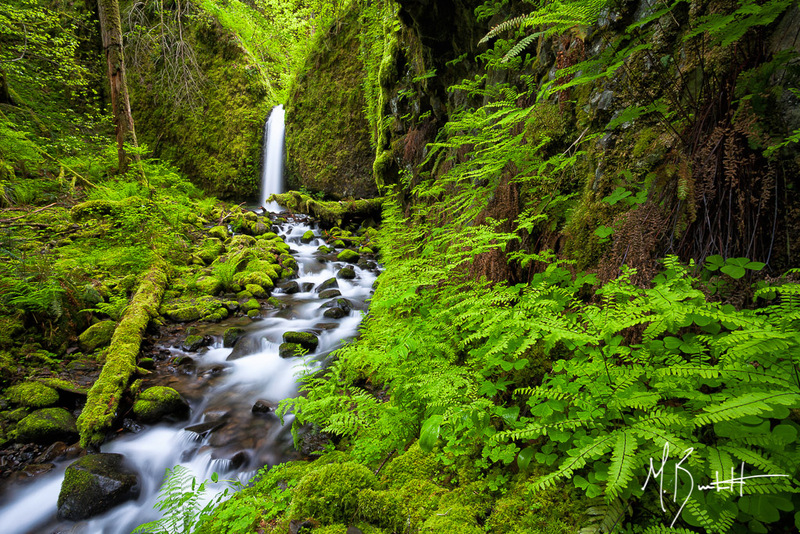 Mossy Grotto Falls, as it’s fondly referred to, is a verdant green waterfall tucked away snugly in small canyon of the Columbia River Gorge. This was my “white whale” for 2014. I set out to explore this part of the Gorge in 2013, but had poor luck in finding it. I set out to find this spot in 2014 and I was blessed enough to find it and spent a morning all alone photographing it. If you do happen to stumble upon this hidden gem, please be respectful of the area due to it’s delicate nature. 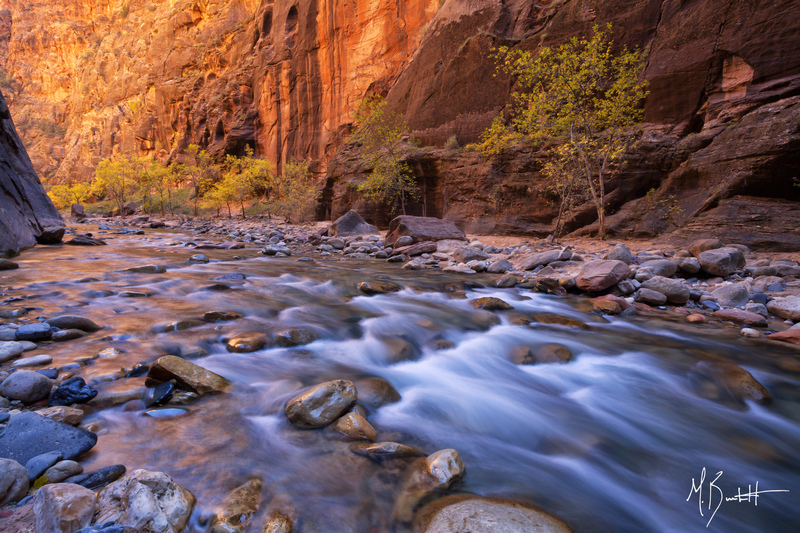 Zion National Park is famous for many beautiful vista’s, but The Narrows may be it’s most famous. This image holds a special place for me. I was able to share the experience of this hike with my father and my wife who had never been before. It was the first time my dad and I had hiked together in a little over 3 years (if you know my history we hiked fairly often before I moved to Oregon) and we couldn’t have enjoyed it more. It was awesome to spend a week with my dad on this adventure. I may be a grown adult now, but I’m still impressed by my dad. He not only did around 5 miles in The Narrow, but the day before completed the trip into the Subway…and the guy’s 62! While this image may not capture my typical bold sunrise or wild cloud patterns, it did capture my heart. It’s a self portrait of myself and our Australian Shepherd, Ellie at our campsite at Broken Top. I’m never really ‘solo’ on solo backpacking trips, as Ellie is always right there with me. She patiently waits while I spend time working on my photography, she never complains, and excitedly leads the way on the trail. I’m excited to see what adventures we’ll get to experience in 2015! I made it a point to set out this fall to explore a handful of new fall color locations here in Oregon. Excitedly I headed east towards Bend in early October after finding out I had been excused from jury duty. I spent an perfect fall day walking along the Deschutes River Trail hoping to find fall color in the aspen groves, needless to say I was not disappointed. What began as an almost cloudless day quickly changed about a hour before sunset. The result: double fall color along the Deschutes. 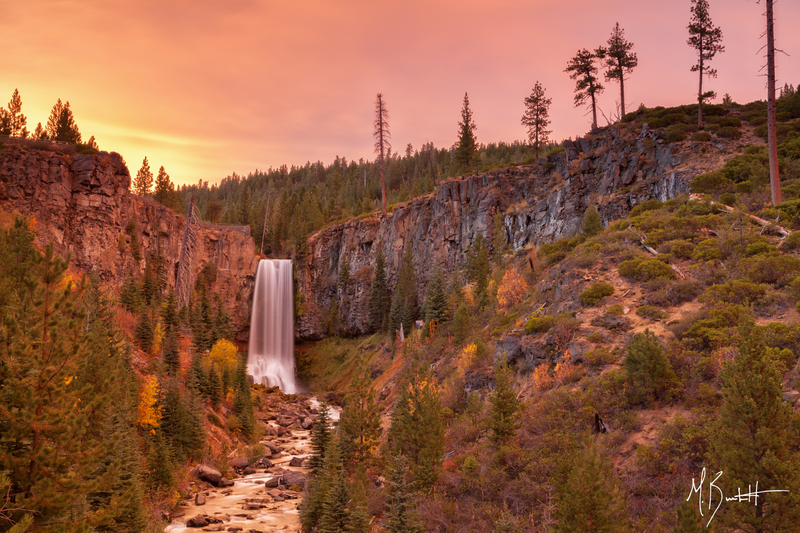 I made it a point to return to Tumalo Falls near Bend to capture the fall colors that surround the canyon walls. In good years the colors are spectacular. Unfortunately I was disappointed in this year’s fall colors, but noted light cloud cover hanging over the falls and decided to stay put and see what would happen. The result was more than I expect with a sunset glow of pink, orange, and yellow painting the sky above. An unexpected stop on a road trip resulted in one of my favorites from 2014. Making my way out of town on my way to Utah, I noticed the yellow glow of the Boardman tree farms on the horizon. I couldn’t pass this by without a stop. The unique man made planting patterns mixed with the yellow glow of fall colors made for a special opportunity to photograph. My wife and I decided to head towards Tahoe as a small side trip while making our way north from Death Valley. With intention only to see the lake briefly and start heading back north, I noticed the sky setting up for a beautiful sunset. Needless to say, we stayed and were not disappointed. Last, but not least. This is my favorite image from 2014. Everything came together perfectly on this evening in July. I’d spent time scouting the location two nights before this shot was taken and hoped to catch a good sunset with all the afternoon thunderstorms in the Cascades. Weather forecasts looked good and I headed up again. No wind, clouds almost to the horizon, and peak bloom. Perfect. Thanks to everyone who showed their support this year, to new social media followers, more new friends made on the trail, and especially my wife, Kiersten, who continues to support my passion as a photographer. I’m excited to see what 2015 has in store and I’m ready for some new adventures,new images and new friends. Happy New Year! Welcome to part 2 in my ‘This is My Backyard’ series. I know, I know, it’s been a while since I wrote part 1, but I’ve been busy out in the field this year! My goal for the series is to highlight some of the very best of the Pacific Northwest, which I’m blessed enough to call my home for the past 6 years. Growing up I’d always dreamed of visiting and seeing the forces of nature that create waterfalls. I never imagined that I’d move away from the swaying wheat fields and summer thunderstorms of my childhood stomping grounds in Kansas, but as fate would have it I moved to a place filled with verdant green forests, water filled streams, and moss covered rocks. That place is now my home, my backyard. The sounds, smells, and feel of watching water rushing over a edge of a cliff is exhilarating. Today I’m sharing six of my favorite waterfall images from this year’s adventures. My waterfall hunting season started early this year. A rare snow storm hit the Willamette Valley in early February and I decided to head out and explore nearby Silver Falls State Park covered in a white blanket. Typically seen with bright green colors of a northwest rain forest, a solid coat of snow was a unique treat. 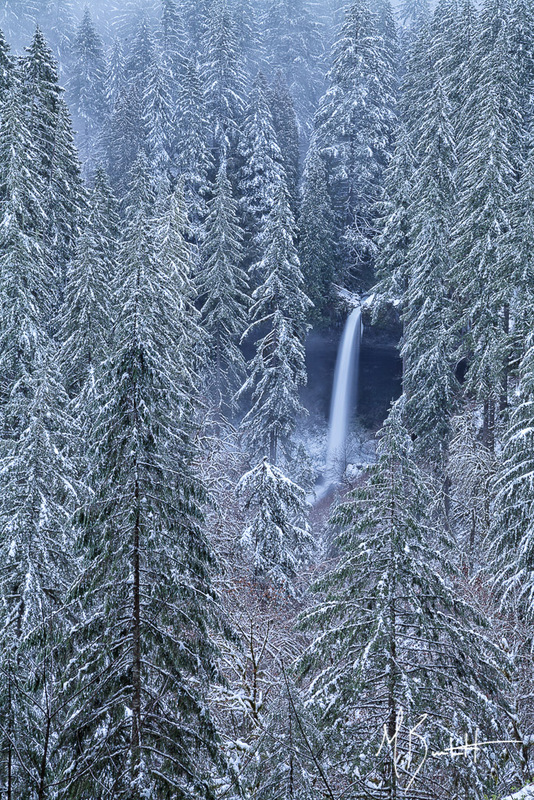 Silver Falls Winter Coat – A rare winter snow storm left Silver Falls State Park covered in white. I entered 2014 with a mission. That mission was to find a small waterfall tucked away off trail in a canyon lined with the most vibrant greens, moss covered rocks, and fern covered walls one could imagine. Part of that mission was fueled by an inability to find this hidden canyon the year before. This year: Mission accomplished. Verdant Mossy Grotto – This off trail waterfall is one of the best hidden gems I’ve ever had the experience to photograph. The Columbia River Gorge is famous for it’s waterfalls and although it’s a short hike to Ponytail Falls, it’s one of my favorite Gorge falls. 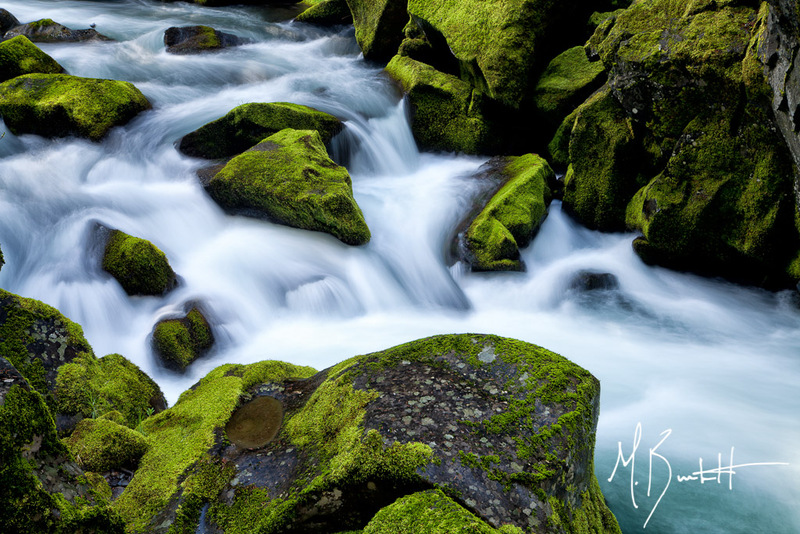 The bright greens of the new spring foliage and mossy rocks frame the powerful creek spring flow. This trail is one of many that leads to a waterfall in the CRG, all begging to be explored. Ponytail Falls – Every spring after the rains of winter warm temperatures return bringing the forest to life. A short steep hike brings you to the end of this canyon of columnar basalt and puts you in the front row of a beautiful and powerful amphitheater. The star of the show is 92 foot Abiqua Falls. If you visit, please be respectful of the area as it lies on private property and those who own it were gracious enough to open it back up to access after several years of closure. Abiqua Falls – Although the ‘Trail of 10’ is just a stones throw away, Abiqua Falls is the highlight of all the falls in Marion County. Every year I make at least one trip to Proxy Falls. It’s my hands down favorite water fall to photographically study. Up close, from a distance, from the side, different flow rate throughout the year; it doesn’t have a bad angle. 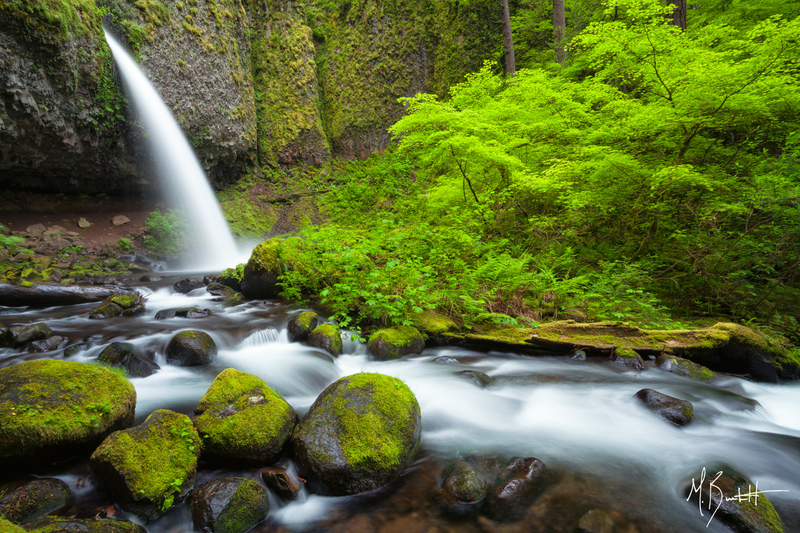 Located in the Willamette National Forest it’s not a difficult hike at 1.5 miles, however requires a little bit of bushwhacking if you want the up close views of Lower Proxy Falls (pictured below) and yes, there’s an Upper Proxy Falls too (but Lower gets all attention). 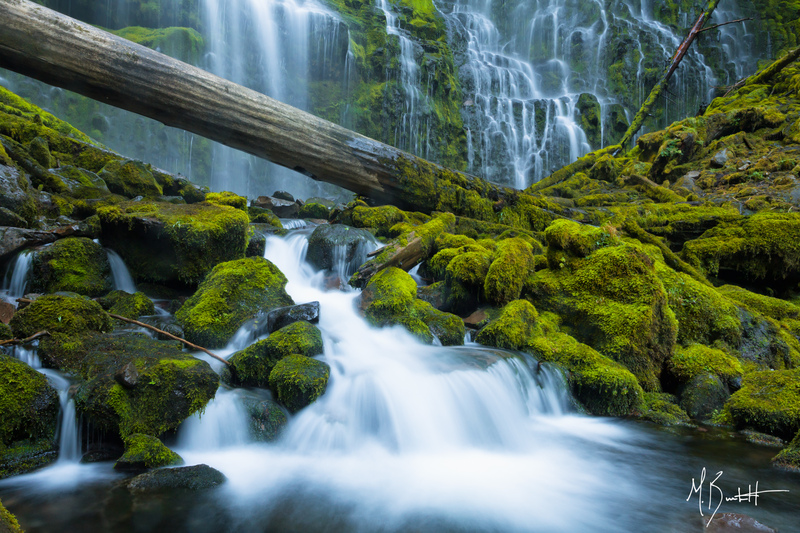 Proxy Falls – My favorite study in photographing a waterfall. One of my Autumn goals was to make a visit to Central Oregon to see how the colors were shaping up around Tulamlo Falls. While the foliage around the canyon wasn’t quite what I expected, the unexpected surprise was the bright pink glow of the sunset that hung above the falls. I love the unexpected moments in photography like this, it’s what keeps me enthused and energetic. 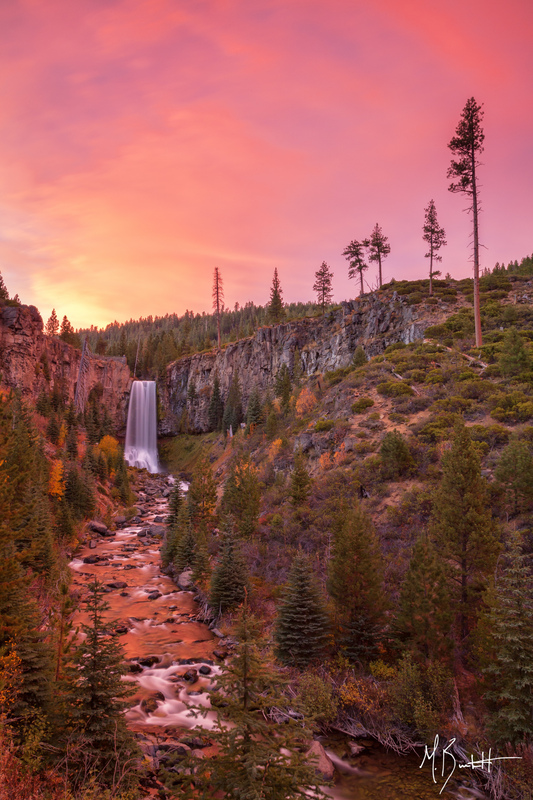 Tumalo Falls Sunset – A vibrant sunset lights up the sky above Tumalo Falls. If you’re in the Pacific Northwest a trip to some of Oregon’s waterfalls is a must. It doesn’t matter which route you take. Whether it’s the Gorge, the coast, the Cascades, or the high desert, you’re bound to stumble upon some beauty. I’m excited to explore more new locations this coming year. Recently I revisted a location that I’ve always thought of as a hidden gem here in Oregon. It doesn’t seem to get the same publicity and ooh’s and aahh’s that Mount Hood, Crater Lake, or the Columbia River Gorge seem to accumulate. With that said, I think it may be one of the more spectacular payoffs for your time and distance hiked that you’ll get in Oregon’s Cascades. I first visited Coffin Mountain with my father 3 years ago on a whim a few days before my wedding. I had read in a hiking guide about a great short hike with 360 degrees views and possible wildflowers. The short description undersold the location – we were blown away. After my first trip 3 years ago I knew I had to return and photograph the mountain in ideal light conditions. 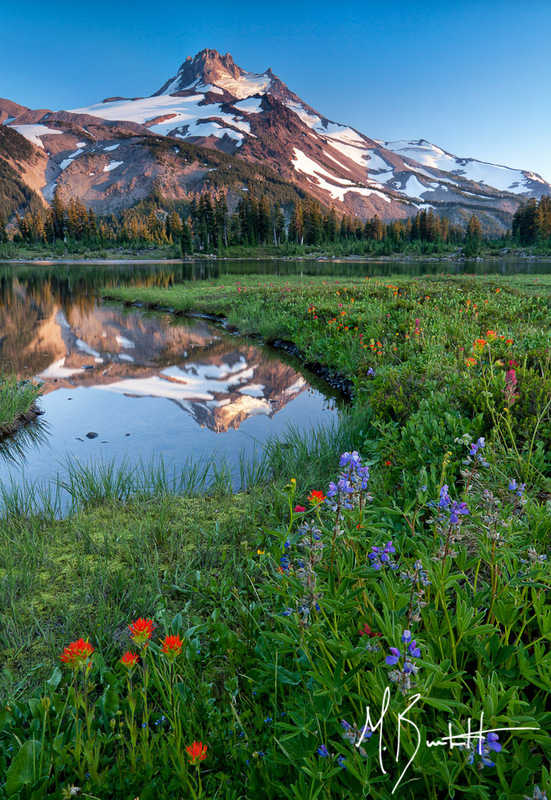 After coming upon information that the wildflowers were blooming in early July, I quickly made plans to visit. Unfortunately, nothing but bright blue filled the skies all around me. Take two: After looking ahead at the forecast I noticed a good chance of afternoon thunderstorms scattered throughout the Cascade range on the next Tuesday. It was go time. I arrived early anticipating a need to scout shooting locations and found several great spots with an array of wildflowers and blooming bear grass. Several cotton candy clouds slowly danced around the sky and I was ready for a nice sunset. What I didn’t anticipate was about 90 minutes prior to sunset all of the thunderstorms that built up to my east, built back and hung above me. I lost the light and everything went flat. Then it happened, the sun hit just above the horizon and just under the cloud cover. Purples, pinks, and oranges lit up the sky and covered Mount Jefferson in an alpenglow that rivals the best I’ve ever witnessed before. This is why I do what I do. Moments like this and being there to see it with my own eyes and to use my camera to frame and capture it are what fuel me to keep pursuing the passion of mine. Here’s a little info on what to expect if you decide to visit Coffin Mountain. The hike starts out in a light forested section of trail, shortly revealing the open meadows of Coffin Mountain and views of Mount Jefferson to the northwest, Three Fingered Jack and the Three Sisters to the east. Once you approach the summit more trees begin to appear intermixed with bear grass when it’s in bloom. At the summit lies a active fire watch station that is manned. On bland weather days, expect a smile and a ‘hi!’ from whomever’s manning the station. From the top you can look 360 degrees, on clear days you can see as far north as Mount Adams and to the south Diamond Peak. The open meadows are a varying flower garden with colors of yellow, blue, red, purple, and white spread across the open hillside. 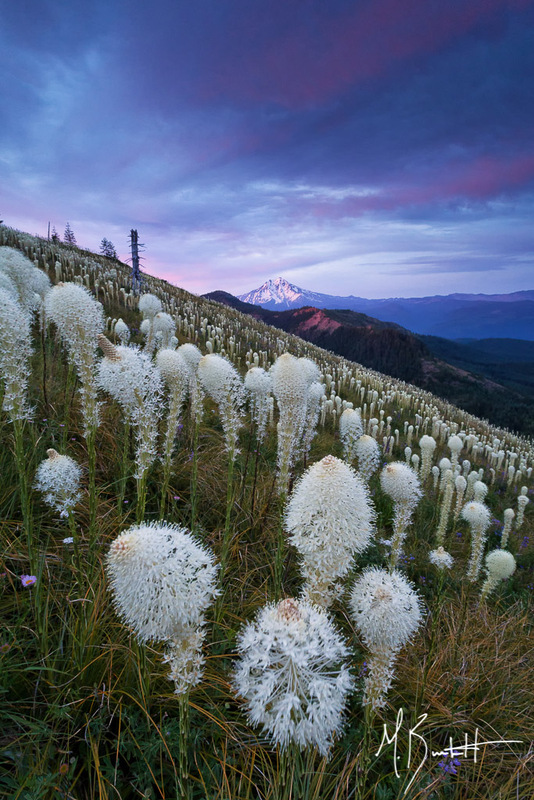 Bear grass, however, is the show stopper. It grows throughout the area, thickly on the hillsides. Timing is everything though, I’ve experienced the bear grass bloom in early August and most recently early July. Total roundtrip is approximately 3 miles and a elevation gain of 1000 feet. It’s fairly steep and more exposed to sun than not so take plenty of water and take into consideration the weather outside. Dogs are welcome on the trail. Last week marked my 6 year anniversary of my move from Kansas to Oregon. I took a leap of faith and packed a U-haul with everything I owned and headed west. Without going into a lot of detail, I would’ve never ever guessed I’d ever leave Kansas. It has been an incredible ride so far. My inspiration for this post came when I was out hiking a few weeks ago and the idea popped in my head. I typically focus on writing about photography and travel (this kinda counts, right?…) Let’s have a little fun. A colorful field of poppies in the Willamette Valley. Just one of the hidden gems I’ve found while pursuing my photography in Oregon. 1. Green – More green in the spring than anywhere I’ve ever seen. 2. 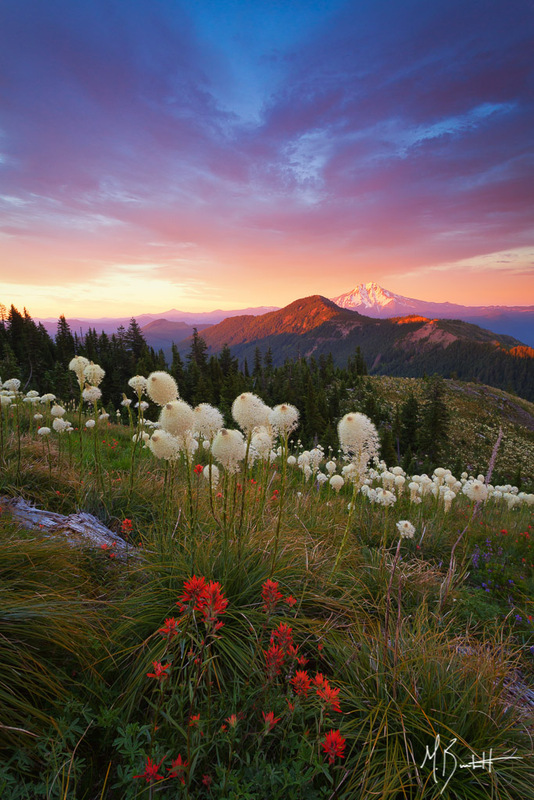 Wilderness – Yes other states have wilderness, but have you seen ours yet? Wow! 3. Beer – Portland’s called “Beervana” for a reason! 4. 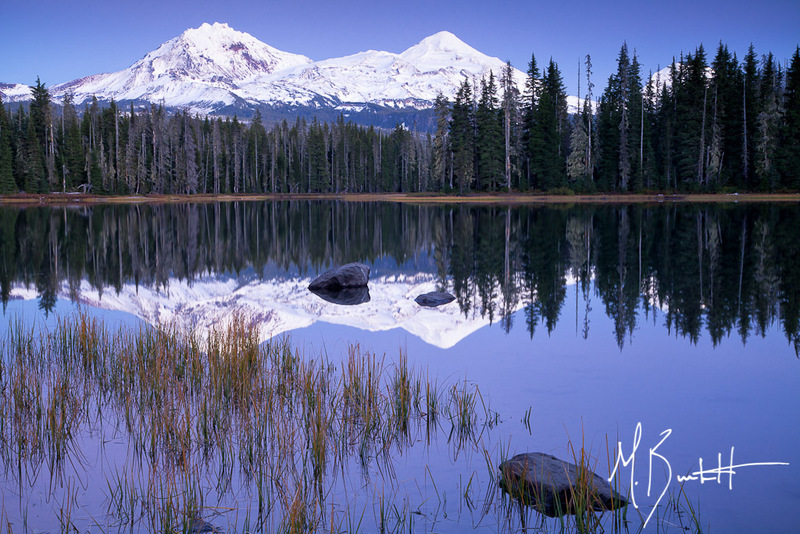 Photography – If I wasn’t in Oregon, I wouldn’t be able to pursue my passion the way I do. 5. Voodoo Donuts – Maple Bacon Bar – Yes, please! 7. Coast? Mountains? Desert? You choose, we’ve got ’em all. 8. Waterfalls – I’ve explored more waterfalls in the past 6 years than I could’ve ever expected in a lifetime, but yet I’ve only seen the tip of the iceberg. Green – check. Waterfall – check. Columbia River Gorge – check. 9. Rain – Yeah, I know it gets a bit depressing in Feburary, but the results in April, May and June are well worth it. 10. 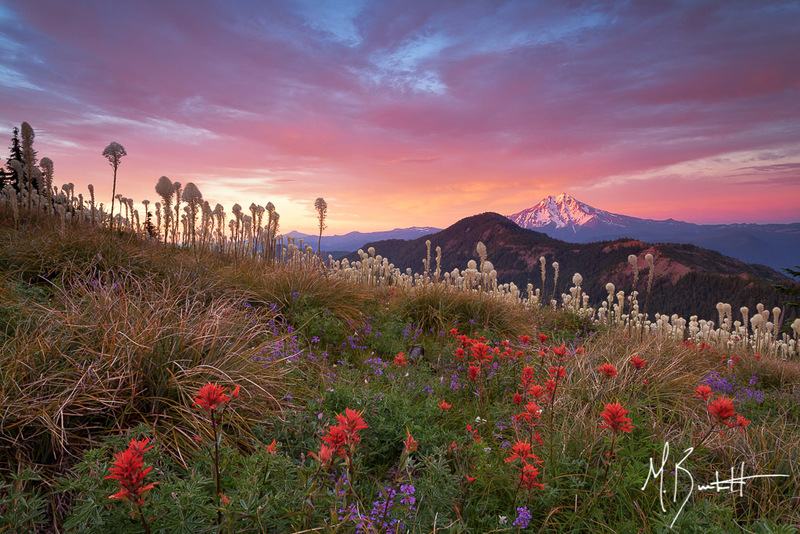 Wildflowers – I’ve photographed wildflowers from the gorge, to the valley, to the alpine meadows of the cascades. 11. Food – Oregon is a foodies paradise – forget Paris or New York city, give me Oregon’s palate for food. 12. Blueberries – U-pick. You bet! 13. Australian Shepherds – I’ll never own a different breed of dog again. Smart. Energetic. Loyal. Perfect. 15. Bend – Central Oregon’s hub of adventure, beer, snowboarding, and in my opinion the prettiest section of the Oregon Cascades. 16. Crater Lake – Oregon’s only National Park (which is a shame) but it represents the NPS well. 17. Wine Country – Famous for the Pinot Noir grape, it makes delicious wine. Mmm, where’s my steak? 18. Oasis Community Church – Thank you for being my church family and home for the past 6 years. 19. Pacific City – My favorite City along the coast – sandstone bluffs, vistas, and Pelican Brewing. 20. Hood River – Great food, beer, and plenty of outdoor adventure – what’s not to like?! 21. Quirky Portland – ‘Keep Portland Weird’ – It’s their motto for a reason. 22. 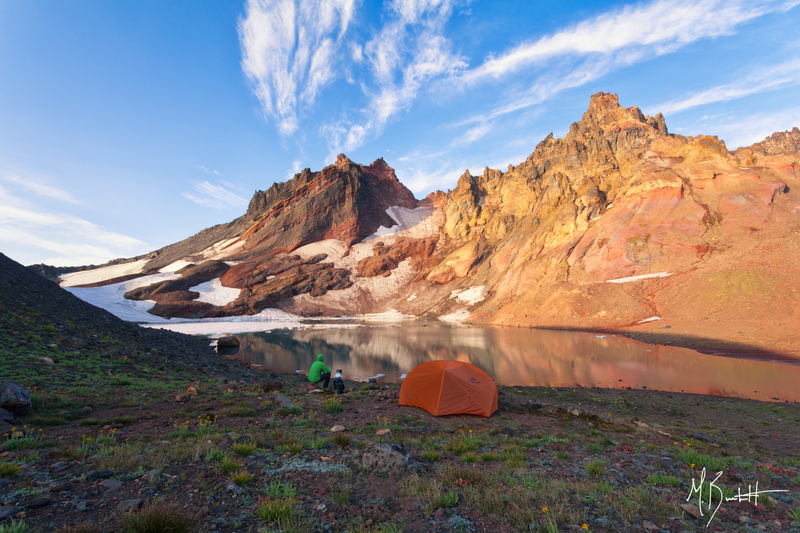 Backpacking – Mt Jefferson, Mt Hood, Mt Washintgon, The Three Sisters – hundreds of miles of trails and hundreds of place to put down your tent for the night. 23. Triangle Lake – Family camp each July, wake boarding, and great memories. 24. Fresh fruits – Berries, apricots, apples, pears, peaches, the list goes on and on. 25. Organic foods – Oregon is on the cutting edge of healthy foods and products. I love that I have access to so many incredible choices. 26. 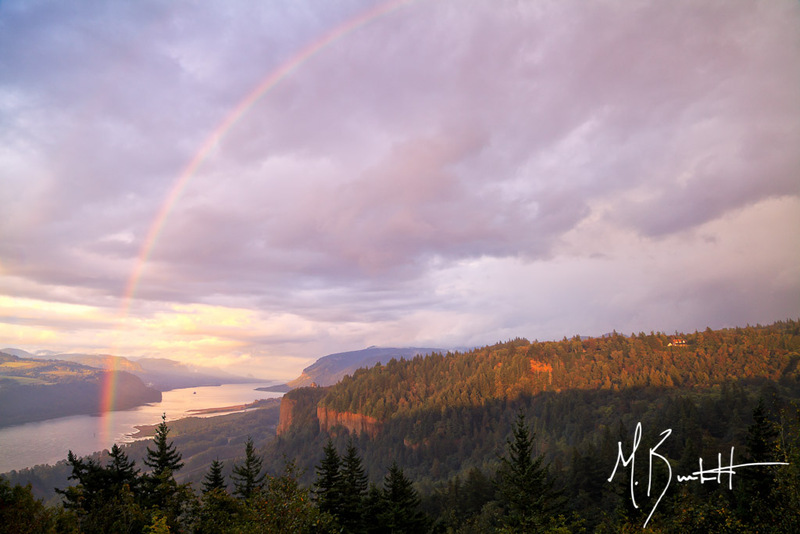 Columbia River Gorge – The mighty Columbia River runs the Gorge creating a recreational paradise. 27. High desert – Smith Rock, The Painted Hills, Alvord Desert, Owyhee Canyons. Just a few of the highlights. 28. Oregon Coast – Rocky cliffs, sandstone bluffs, sand dunes, crashing waves. Up for storm watching? 29. Thai Food – I honestly can’t name a Thai restaurant in the city I grew up in, but I can name 8 just in Salem…nothing like a yummy bowl of Panang Curry. 30. Cannon Beach – My second favorite Coast City great for running your dog and Ecola State Park is right on the north end of town. 31. 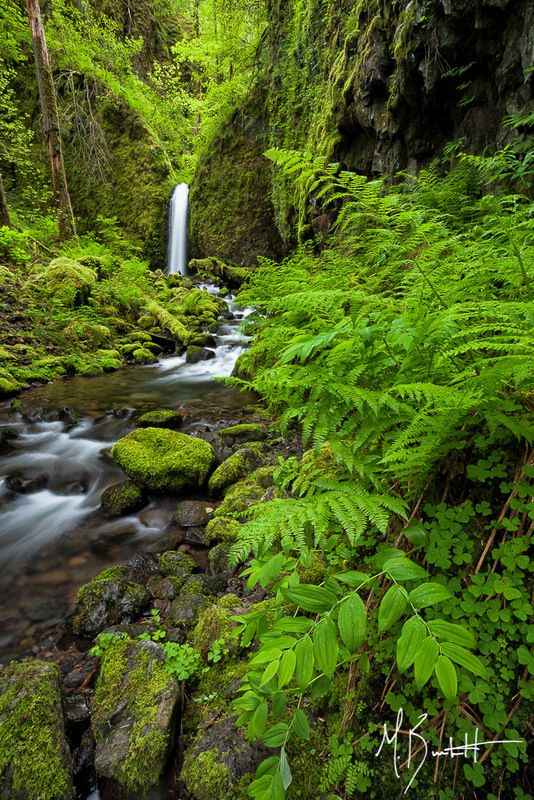 Silver Falls State Park – In a need of a great day hike? The trail of 10 is perfect (10 waterfalls – 9 miles). 32. Food Trucks – Who knew some of the best food in the world would come from semi-sketchy portable trucks? 33. 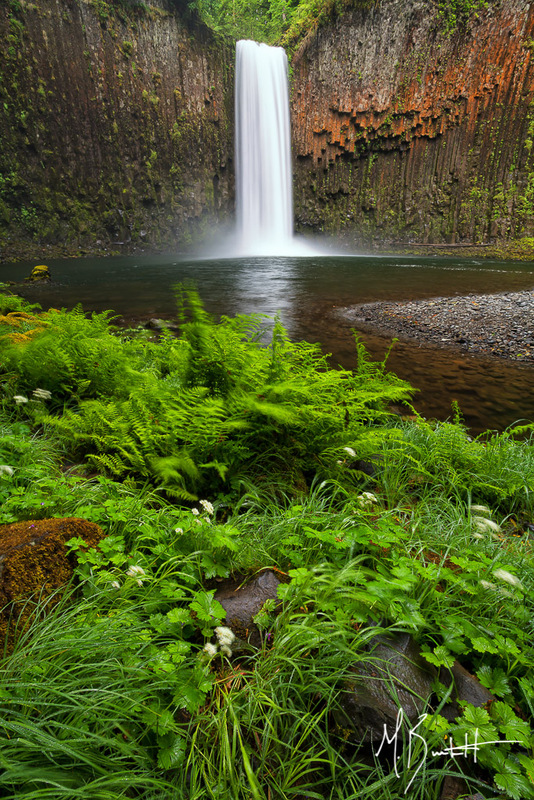 Hidden Gems – Abiqua Falls, Mossy Grotto Falls, Coffin Mountain…. Many of the privileges of living here are knowing and accessing these places. Most tourists would never get to see these any many more incredible places not within the borders of a park. 34. Fresh Air – Just try and tell me the first breath you take after a good rain in the forest isn’t the most incredible smell in the world. 35. Powell’s Book Store – I know it’s 2014, but I still love the feel and smell of paper books. If you can’t find it at Powell’s, it may not be in print any more. 36. Hood to Coast – Almost 200 miles & 30 hours later you’re exhausted, sore, and hungry….but man was it worth it! 37. Dogs are Welcome – Go for a stroll in downtown Portland and more than likely you’ll see people with their furry family members in tow. Restaurants with outside seating, yep they’ve got water bowls for your pooch. 38. Small Business – Oregon loves a good entrepreneur! 40. Hiking – Wait, I don’t have to drive 9 hours to get the mountains? Woo-hoo! I hope you’ve enjoyed reading this list as much as I enjoyed writing it. The journey so far has been incredible. I can’t wait to see what I add to this list in the next 6 years. Now back to writing about photography…. I’m NOT a believer in New Year’s resolutions. Never have been, (probably) never will be. But I have spent a little time this past couple weeks thinking about where I wanted to go this year with my photography, both personally and professionally. I believe there is some power in putting pen to paper (or fingers to keyboard). So I decided to list those ‘goals’ out, including my thoughts for each. I’m sure as photographers we all feel this way from time to time. Like we are going through the motions, just taking new images over and over again. This year I feel encouraged and inspired to be intentional about what I shoot, where I shoot, and when I shoot. I want to create new and unique images. In 2011 and 2012 I spent a lot of time reading books, blogs, posts, and googling educational information in order to keep learning constantly. But I’ll be honest, this past year I’d been so focused on shooting I spent almost no time on out of the field education and working on my technical knowledge. Looking back at a handful of images from this past summer, honestly, I can see it. Silly mistakes I just shouldn’t have made. This year: more education. I’ve meet a lot of really great people while out shooting and through social media the last couple years, but I was a bit of a loner in 2013 only spending time either with my bride or on trips alone. I want to spend a little more time connecting with other photographers as I travel, hike, and backpack. Not only does that interaction foster friendships, but it helps with creativity and challenging ourselves and our peers to be better. After spending a handful of photography travels this past year backpacking, I want more. I want to spend more time in my tent away from the beaten path. Not only to create great images, but to inspire my soul and refresh my mind. This is a simple goal, this is my backyard and it’s beautiful. I like to travel, but I’ve got a whole playground here to explore and photograph. I can think of a dozen new places to explore this year. My goal: see them all and more! As a photographer I’ve got enough images on hard drives and my computer to last a life time. Great, but I want to be able to share my art and nothing speaks quite as powerfully for a photographer than actual print on paper. I had a few minor opportunities last year and learned quite a bit, but this year: I want to expand on those opportunities, displaying my more and higher quality of art work for others to enjoy. I’m passionate about my landscape photography and from time to time include people in those wild places. But the majority of my portfolio lacks a human element. Nothing puts scale and awe into a location like the people who are playing in it and enjoying it. I want to develop my skills and portfolio as an adventure photographer, hopeful leading to more opportunity to publish and display my work. What are your goals personally and professionally for 2014? I’d love to hear feedback from others what you think about this list. Also tell me about where, what, when, and how you are working towards those goals. It’s that time again. The end of 2013 has arrived and I’ll be sharing my favorite images from 2013. After a very rough end to 2012 with a physical injury, I was eager to start strong in 2013. Gladly the year started and finished strong for me personally and professionally. I was blessed to re-visit some iconic locations like Joshua Tree NP, Grand Teton NP, and Yellowstone NP while exploring new locations such as Valley of Fire State Park, the Mt. Jefferson Wilderness, and the Alpine Lakes Wilderness. I accomplished several of my personal and professional goals: I was able to get published twice – locally only (small potatoes, but it’s a start). I spent more time in the wilderness, hiking and backpacking. I focused more on photographing the beauty right here in Oregon. I learned more about techniques in the field and post-processing that pushed me to be a better photographer. I pushed myself to look not only and the big, grand scales, but the small, intimate details in our landscapes. And I made new photography friendships all along the way. 2013 was a good year. I happy to once again share my top images in Jim Goldstein’s annual blog project. It’s an incredible gathering of photographers from around the world that Jim puts hard work into each January to showcase their best works from the past year. Please be sure to check out the other great posts once it’s completed in early 2014. 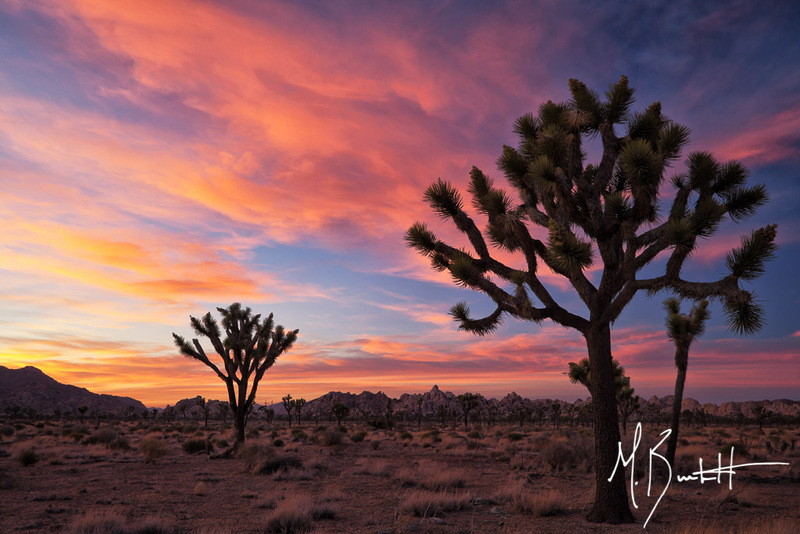 Joshua Tree National Park is one of my personal favorites in the park system. Something about the white tank granite and sprawling ‘groves’ of Joshua Trees speaks volumes to me. Finally after 4 or 5 visits over the past 10 years, I was able to capture a dynamic sunset among the trees that I’d missed out on all those other times. I spent a handful of days in Valley of Fire SP on my annual southwest photography trip and was amazed by the incredible beauty packed into such a small park. 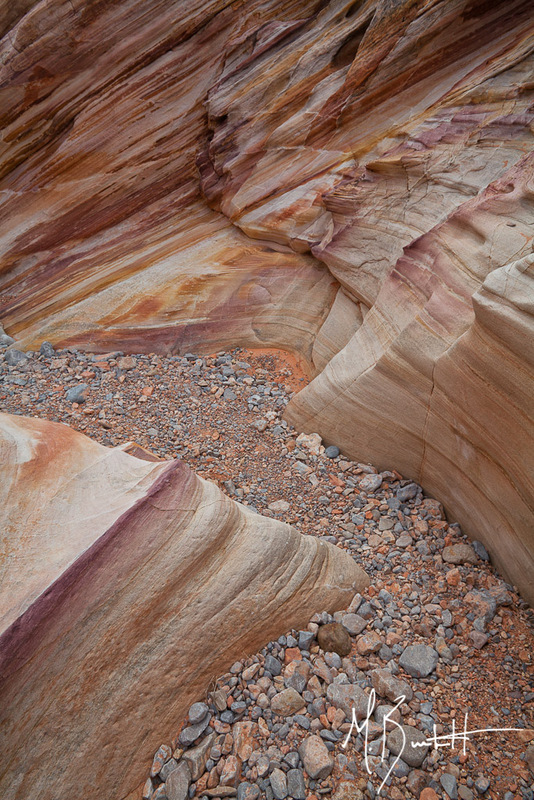 Of course I went to all the most popular locations and capture my ‘own’ images, but I was excited to find this small slot canyon in the White Domes area with these incredible layers of purple, white, orange, pink and yellow sandstone flowing on the sides of this wash. I patiently spent time here finding a composition that was simple, but dynamic to display this unique portion of the canyon. Sometimes the journey is better than the destination. I took the short hike to Toketee Falls this past spring, which is a very photogenic waterfall, but a took a little ‘off the beaten path’ route back to the trail head. What I came up on this small section of the North Umpqua river tightly shooting between the moss covered and emerald green rocks that define the Pacific NW. Not my typical dynamic landscape image, it was a more intimate view that captured my attention. Some places speak to us, spending time there feeds us, makes us feel home. For me, this is Grand Teton. I’ve been to GTNP a half dozen times now and I’ve truly never though any less of the experience than the time before. In fact I think I appreciate it more each time. This June was no exception and was the most photographicly productive time I’ve ever had there. 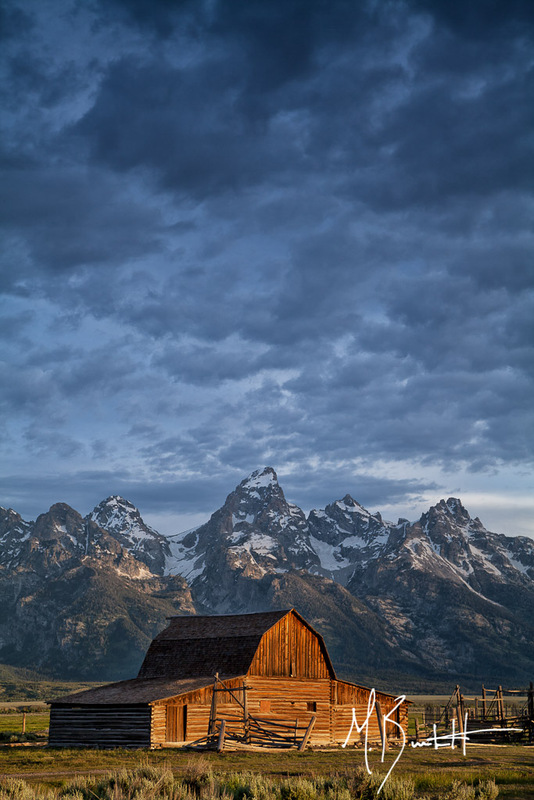 Shortly after a nice pink sunrise the real show started with a storm moving into the valley and the light just punching through enough to illuminate the barn and Tetons. 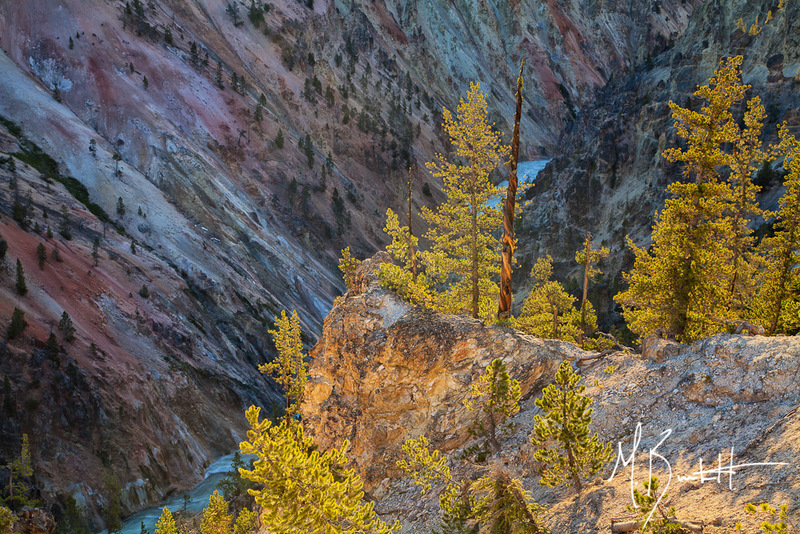 This image captured my eye as I turned to leave after an early morning sunrise on Lower Yellowstone falls. I noted that just this little section of trees had began to glow as light peaked over the edge of the canyon. A warm respite to the almost freezing temperatures that morning. One of my personal goals in 2013 was to do more backpacking, less car camping. Working to get images, putting more ‘wilderness’ into my craft. This image is one of the defining moments of that goal. An August backpacking trip with my wife (her first official) took us into, what I personally think is, one of the most beautiful wilderness experiences in the country. Opportunity for creating images is endless and I’m already planning my return for next summer and fall. If someone hasn’t ever said ‘photography is an art of opportunity’, they should have. Sometimes it’s all about right place, right time, sprinkled with a little luck. I went out one afternoon in September looking to capture some waterfall images in the CRG, however a severe downpour put a quick end to that idea. I opted for taking the long way home and stopped along a popular viewpoint in the CRG for the heck of it. The rain let up and decide to give me about 4 minutes of sun, clouds, and a perfectly placed rainbow. 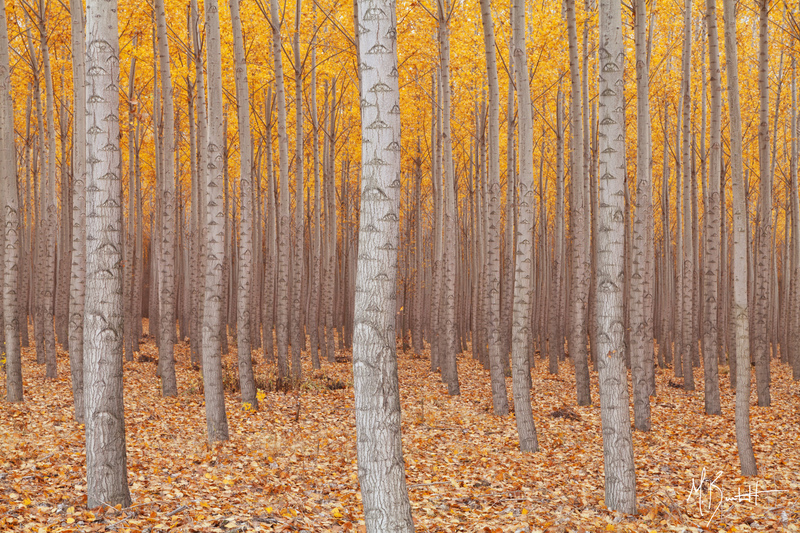 An unusual amount of snow hit the Oregon Cascade range in late September, creating a unique fall setting for images. Blue hour or as I like to call this one “Purple hour” created a unique purple sky and bright white reflection on the snow covered Three Sisters, creating an opportunity for one of my favorite images of the year. I truly believe that intimate, simple landscapes can be as powerful as any grand ones. 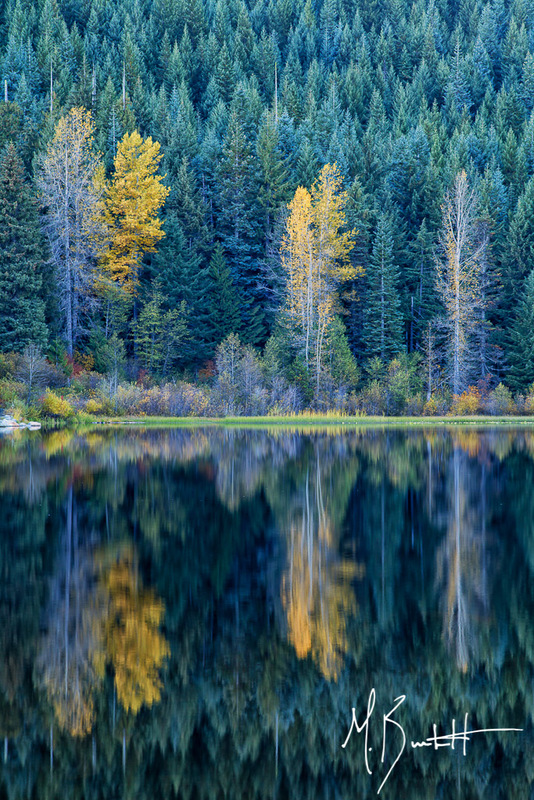 As I walked along the banks of Trillium Lake, this group of trees in varying stages of color change, from peak to past peak, popped against the green curtain of evergreens. Mixed with the reflection, this image became one of my favorites from 2013. 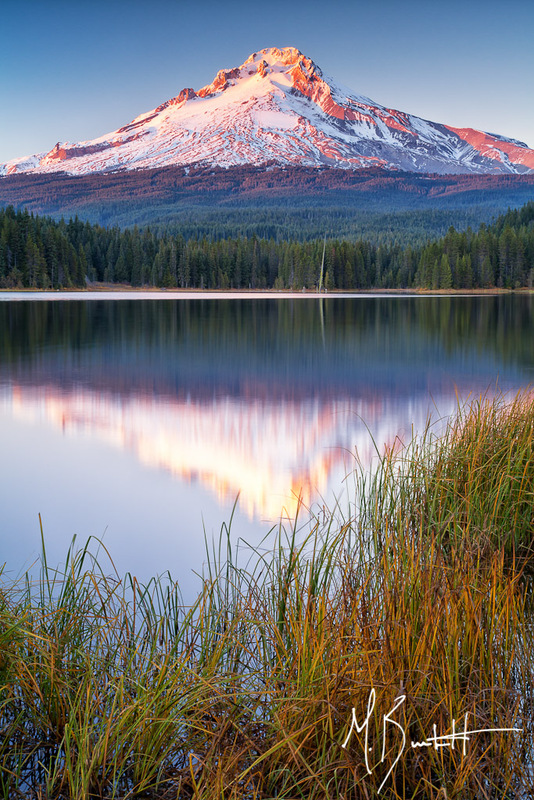 I had avoided Trillium Lake like the plague for so long, mainly due to it’s very easy access and popularity. But in trying to waste time until I ended up at my ‘planned’ sunset destination, I was mesmerized. It’s popular, it’s busy..but for a reason. Needless to say, I didn’t end up at my final destination, I stayed put at Trillium. Looking for more than just a reflection from the very popular south end, I bushwhacked a bit into the reeds along shore to capture the pink alpenglow hitting Mt Hood at the end of this October day. Thanks to everyone who showed their support this year, to new social media followers, new friends made on the trails, and especially my wife who continues to support my dreams as a photographer. I’m excited to see what 2014 has in store and I’m ready for some new adventures,new images and new friends. Happy New Year!